Violence during a protest in a St. Louis suburb has forced the public transportation agency Metro to suspend light rail and bus service to that area until Sunday. Metro said on Twitter that because of the violence and vandalism, it will not serve the Delmar Loop station overnight. It did not say specifically when service would resume. 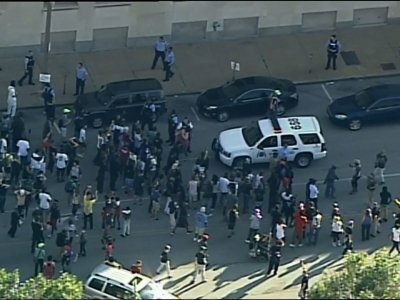 The St. Louis area has seen two days of sometimes violent protests in the wake of a judge’s ruling on Friday acquitting former police officer Jason Stockley of first-degree murder. Stockley fatally shot a drug suspect after a chase in 2011. Stockley is white. The man killed, Anthony Lamar Smith, was black. Nearly three dozen people were arrested Friday. Saturday’s arrest total has not been released. Violence has erupted after hundreds of police moved in to confront a small group of protesters who refused to disperse after a march in the St. Louis suburb of University City, a popular area with restaurants, bars and shopping. Shortly before 11 p.m. Saturday, the police formed lines and pushed the demonstrators down the street, eventually announcing that the protest had become unlawful and ordering demonstrators to disperse. Protesters fled down the street, throwing items such as water bottles, trash cans and trash can lids at police and breaking business windows as they went. There was a constant pop, pop, pop of breaking glass. People scrambled for safety in alleys and parking garages. Restaurant patrons huddled in corners to remain safe. It was unclear if anyone was injured. Several people were seen in handcuffs. After three hours of marching and chanting in and near a popular entertainment district in the St. Louis suburb of University City, protesters have disbanded with plans to gather and demonstrate again Sunday afternoon in St. Louis. Police had maintained a heavy presence, including a helicopter overhead, but never deployed officers during the peaceful march Saturday evening. The quiet evening came after Friday night’s marches, where there was sporadic vandalism and violence. Some in the group went to Mayor Lyda Krewson’s home and broke a window and splattered paint. A heavy police contingent responded and eventually broke up that group with tear gas. St. Louis Mayor Lyda Krewson is encouraging residents not to change their plans as protesters stage a second day of marches and disruptions after the acquittal of a white former police officer who fatally shot a black man. Both Krewson and interim police Chief Lawrence O’Toole said the protests have been largely peaceful and residents shouldn’t change plans because of them. Krewson says she’s disappointed that concerts by U2 and English singer-songwriter Ed Sheeran had been canceled this weekend. St. Louis police say there were 33 arrests, 11 injured officers and property damage to Mayor Lyda Krewson’s house during Friday protests. They also say there was damage to two police vehicles, the St. Louis Public Library and 10 businesses as protesters marched downtown and in the Central West End. St. Louis interim police Chief Lawrence O’Toole says Saturday evening that five officers were taken to hospitals after being hit with bottles or bricks. The arrests of protesters included many for failure to disperse, resisting and interfering. Saturday evening, protesters staged a six-minute die-in to bring attention to the six years between suspect Anthony Lamar Smith’s death in 2011 and Stockley’s trial. A few hundred protesters were beginning a march in the St. Louis suburb of University City in the latest of two days of demonstrations in opposition to the acquittal of a white former police officer in the shooting death of a black suspect. The so-called Delmar Loop where the march is taking place is an eclectic district that includes hip concert venues, restaurants, shops and bars and includes the famous Blueberry Hill where Chuck Berry played for many years. The marching and chanting was similar to demonstrations Friday night in the Central West End neighborhood in St. Louis and earlier Saturday at suburban malls. Both U2 and Ed Sheeran canceled planned concerts in St. Louis Saturday and Sunday because police couldn’t guarantee adequate security during the protests. A second major act has canceled a concert in downtown St. Louis in the wake of protests over the acquittal of a white former police officer charged in the killing of a black suspect. English singer-songwriter Ed Sheeran’s sold-out Sunday night show at the Scottrade Center was canceled for the same reason cited earlier Saturday by U2 when the band canceled a Saturday night performance: Police say they cannot guarantee the typical level of security as the city faces ongoing protests. Hundreds protested Friday and Saturday in downtown St. Louis, in an upscale section of town and in well-to-do suburbs. More protests were expected Saturday night. The U.S. Department of Justice says it will not open a new civil rights investigation into the fatal shooting of a black suspect by a white former St. Louis policeman, one day after the officer was acquitted in the case. The head of the NAACP St. Louis on Friday called for President Donald Trump and the Justice Department to investigate Jason Stockley. A judge ruled Friday that Stockley was innocent in the 2011 shooting death of 24-year-old Anthony Lamar Smith. The acquittal set off raucous protests that continued into Saturday. Justice Department spokeswoman Lauren Ehrsam says the department previously looked at the case in 2012 and decided not to prosecute, and again in 2016 after charges were filed in St. Louis. Ehrsam says the Civil Rights Division concluded the evidence did not support prosecution under criminal civil rights statutes. Protesters angry over the acquittal of a white former St. Louis police officer in the killing of a black man briefly marched through two malls in an affluent area of St. Louis County. Authorities had to temporarily close West County Center in Des Peres around noon Saturday when 200 to 300 people marched and chanted. There were no arrests and nothing was damaged, but many stores immediately pulled metal security screens over their shop fronts once protesters arrived. A short time later, protesters went to Chesterfield Mall in Chesterfield and held a brief demonstration. There was no immediate word of any arrests. The area erupted in protests Friday after a judge acquitted Jason Stockley of murder in the 2011 shooting death of 24-year-old Anthony Lamar Smith. Friday night protests turned violent, including a window broken and paint thrown onto the home of Mayor Lyda Krewson. Nine city police officers and one Missouri State Highway Patrol trooper were treated for injuries. A few hundred people protesting the acquittal of a white former police officer in the killing of a black man flooded an upscale suburban mall briefly before heading out, with plans to reassemble in downtown St. Louis. Authorities were taking steps to close West County Center in Des Peres shortly before noon Saturday before protesters left. Many stores did close and pulled metal security screens over their shop fronts. Several hundred protesters met Saturday morning in a suburban park to plan next steps. They forced members of the media to stand away from them, over the objections of the reporters, including one from the Associated Press. At that meeting, they devised the plan to meet at the mall. Police generally stayed a step ahead of protesters on Friday, preventing them from disrupting high-traffic areas. Rather than march to the mall Saturday, protesters took separate cars from the park and showed up at the mall an hour later. About 300 people have gathered in a suburban St. Louis park to discuss how they will continue to protest the acquittal of a white former police officer in the killing of a black man. Hundreds protested Friday after a judge acquitted former St. Louis police officer Jason Stockley of first-degree murder in the 2011 shooting death of Anthony Lamar Smith. As they left Saturday’s meeting in Heman Park in the suburb of University City, protesters said they were heading to a mall, but they didn’t specify which. Susanna Prins, a 27-year-old from University City, was carrying a sign that read “white silence is violence.” She said she was protesting because doing nothing makes someone complicit in the brutalization of others. Thirty-three-year-old Simon Rodriguez, of St. Louis, said he felt obligated to protest what he called an inappropriate and immoral verdict. The Irish rock band U2 has canceled its Saturday night concert in St. Louis after police told concert organizers that they couldn’t provide a typical level of security because of protests. Hundreds marched Friday after a judge acquitted a white former St. Louis police officer in the 2011 shooting death of a black suspect. The protests are expected to continue on Saturday. Police say nine city police officers and one State Highway Patrol officer were injured in Friday’s protests. There were 23 arrests before 6 p.m. and an unknown number of additional arrests after that. The band says on its website that it can’t in good conscience risk its fans’ safety. The site outlines plans for refunds. Activists say they will meet again Saturday to plan further protests after the acquittal of a white former St. Louis police officer in the fatal shooting of a black man. Hundreds protested Friday. They marched for hours in mostly peaceful demonstrations, until a broken window at the mayor’s home and escalating tensions led riot-gear-clad officers to lob tear gas to disperse the crowds. Activists had for weeks threatened civil disobedience if Jason Stockley were not convicted in the 2011 death of 24-year-old Anthony Lamar Smith. That stirred fears of civil unrest and the erecting of barricades around police headquarters, the courthouse where the trial was held and other potential protest sites. More than 20 arrests were made by early Friday evening. Police reported that 10 officers had suffered injuries by the end of the night.